The problem boils down to a single comparison: A defense would prefer to intentionally allow a TD whenever the probability of scoring a TD in response exceeds the total probability of the offense missing the FG attempt plus the possibility that either a FG to TD can be scored in response to a successful FG. It's a very complex problem with many moving parts. To simplify the analysis, there are several assumptions needed. The intent here is to begin to get our arms around a seemingly impenetrable problem. First, for now, I'll only look at first downs as decision points. In other words, we'll decide whether to play for the stop or to allow a TD immediately following a series conversion by the offense. Second, once within reasonable field goal range, the offense will only run the ball and will not make another conversion. Of course they could convert, but this would be the least preferable outcomes for the defense. The possibility of a series conversion would only add weight to the scale on the side of intentionally allowing a TD. As with other analyses questioning conventional wisdom, it's best to choose simplifying assumptions that count in favor of the conventional choice and against the unconventional choice. In other words, this analysis says, "Coach, even if you were to certain to get the stop, you would still want to allow the TD..."
Another assumption is that the team on offense will play smartly enough not to commit a significant penalty or turnover. Also, the offense will gain a modest amount of field position on its three plays prior to a FG attempt. For the sake of simplicity, I'm going to say there will be 5 yards gained between 1st and 4th down prior to the FG attempt. Unless the offense is at a very long FG attempt range, a few yards in either direction will not make a large difference in the final analysis. Additionally, the offense will use 39 seconds between plays (whenever a timeout is not called or two-minute warning does not occur), and plays themselves will take 6 seconds. Lastly, the analysis assumes that after a score, the subsequent drive will start very near a team's own 20-yard line. This is plausible because touchbacks are now so common that the average starting position following a kickoff is a team's own 22, and touchbacks would be preferred by the receiving team because no time elapses on the play. If a team does allow a TD, it would need its own in response to win. 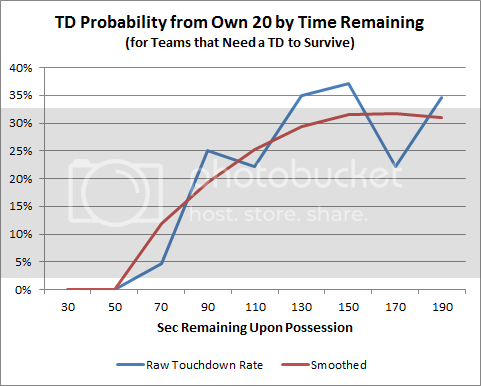 The probability of scoring a TD is a function of only time remaining. The probability estimates for scoring are based on recent history where teams need a TD to tie or win on a final possession. If the team on defense forces the FG attempt and it's successful, a TD or FG in response would be needed to win. The probability of scoring either a TD or FG is also a function of time and based on recent historical scoring rates for teams that need a score to tie or win in the endgame. C. Getting your own TD in response to an intentionally allowed TD at the current time remaining (minus the duration of the play). 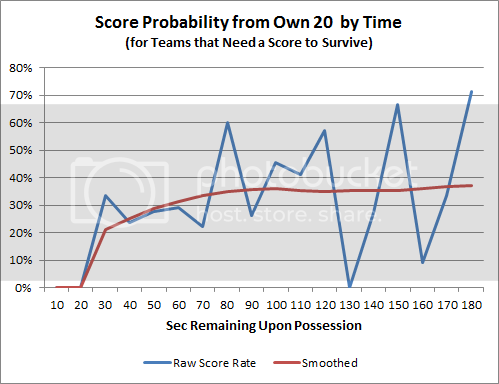 The next four parts of this series will estimate the time that the team on defense will regain possession (part 2), estimate the probability of a failed FG attempt (part 3), estimate the probabilities of the team on defense responding with its own score (part 4), and present the final results (part 5). The graph below indicates how much time will be on the clock at kickoff (vertical axis) based on the time remaining at the 1st down snap (horizontal axis). This assumes the offense will attempt to keep the clock running on 1st, 2nd and 3rd downs, and the defense will use its timeouts whenever a play does not span the two-minute warning. It also assumes the offense will consume 39 seconds between plays whenever the clock is allowed to run and that the duration of each play is 6 seconds. Each color represents a number of timeouts remaining to the defense. The sharp vertical segments indicate the effect of the two-minute warning. 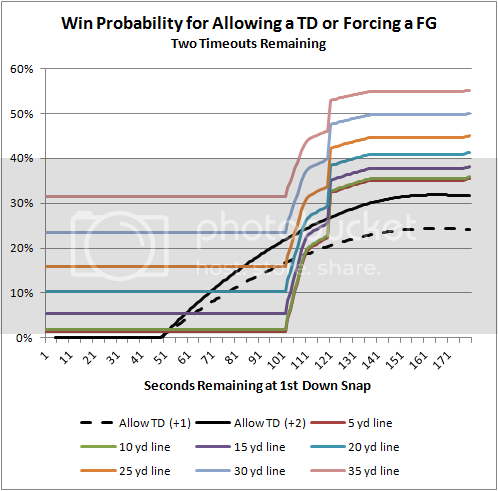 These numbers are critical to the analysis because they will largely determine likelihood of scoring in response to either a forced FG or an allowed TD, which in turn will determine which is the better option. 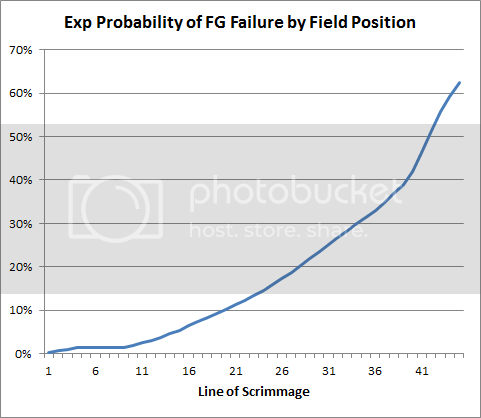 The next three installments will estimate the probability of a failed FG attempt (part 3), estimate the probabilities of the team on defense responding with its own score (part 4), and present the results (part 5). But what really matters is the inverse of the chart above. What we care about is the expected probability of failure, that is, one minus the probability of success. The chart below provides a different perspective, emphasizing how the FG failure rates dramatically increase with range. The final two parts of this post will look at the probabilities of a responding scoring drive (part 4) and will present the final results of when a defense would prefer to allow a TD to forcing a FG (part 5). The probability of success drops precipitously under 30 seconds to play. That appears to be the very least amount of time for a team to get into FG range from a team's own 20. But time in excess of 30 seconds is only marginally more valuable as time remaining increases. In this case, the offense now needs a TD of its own. Like the situation that requires a response to a FG, the team now on offense is assumed to gain possession at or very near its own 20-yard line. The preceding TD play was estimated to consume six seconds. For this estimate I looked at all endgame situations in which the offense needed a TD to survive and had a 1st down very near its own 20. The graph below plots the success rate by time remaining. 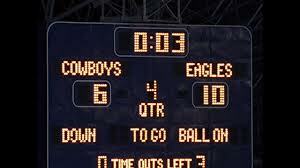 As mentioned previously, timeouts remaining for the offense do not have a measurable effect. The jagged blue line is the raw data, and the red line is the smoothed estimate. Without the possibility of a FG, the curve appears smoother than the probability of either a TD or FG, at least according to the regression. I intuitively suspect that the true probability is closer to initial steepness that the raw numbers indicate, but for now I'm leaving the regression as is. It's another factor I'd be willing to revisit. Comparing the two charts (FG or TD needed vs. TD needed) suggests that teams play differently, and perhaps irrationally, based on the score situation. When time is not too pressing (with about 2 minutes or slightly more to play), offenses that need a TD appear slightly more likely to be successful than those that only need a FG. I suspect this is due to the illusion of FG "range" as well as risk-reward balance for both the offense and defense. Next, the fifth and final part of this series will put everything together and present the results. The allow-the-TD strategy is the simpler one to value. We can account for the time of the intentional TD play and plot the probability of responding with another TD as a function of time. However, there is one wrinkle. If the team on defense is only ahead by one point, the offense would be smart to go for the two point conversion following a TD, allowed or not. If the offense converts the two point conversion, a response TD only ties. If the two point conversion fails, it's no different than kicking the extra point. A response TD wins either way. 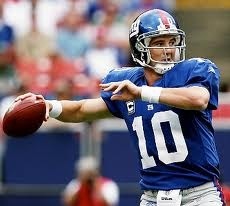 The offense therefore has nothing to lose by going for the two point conversion. The value of forcing the FG is slightly more complicated because it combines the possibility of a failed FG with the possibility of responding with another score. There are too many variables to show in a single illustration, so presenting the results required some creativity. There are timeouts, field position, time remaining, plus the result variable, win probability. To simplify things, the results are broken out into separate graphs for each possible number of timeouts remaining. Also, field position is represented by multiple lines on each graph, with each color denoting a 5-yard increment. 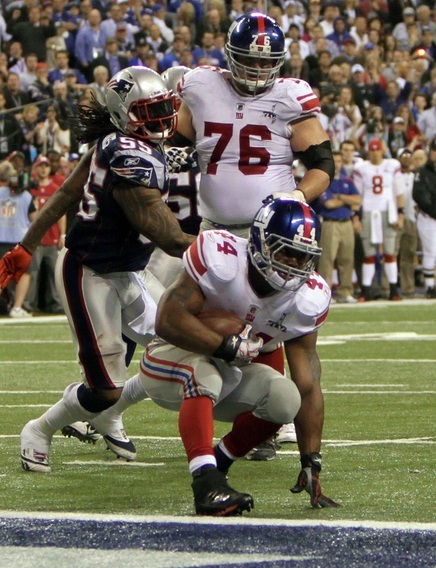 I'm going to go out of order so I can illustrate the results with a prominent example from Super Bowl 46 between the Giants and Patriots. Up by 2 points, the Patriots defense took the field to stop a final Giants drive that started on the New York 12 with 3:46 to play. It took only three plays for the Giants to make it inside New England's 35. The graph below shows the win probability for defenses with two timeouts remaining. 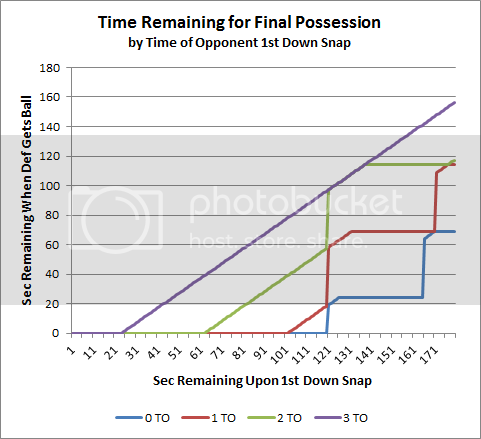 The horizontal axis is time remaining at the 1st down snap. The vertical axis represents the wp for the various situations described in the curves. The black line is the wp for allowing an intentional TD. The colored lines are the wp for forcing the FG attempt and each one represents the field position at the 1st down snap. Wherever the black "allow TD" line is higher, an immediate offensive TD would be preferable to forcing a FG. You'll notice two abrupt vertical inclines in the colored curves for the force-FG option. The leftward one is due to the rapidly increasing probability of responding to a made FG with a score with respect to time. The second is due to the two minute warning. 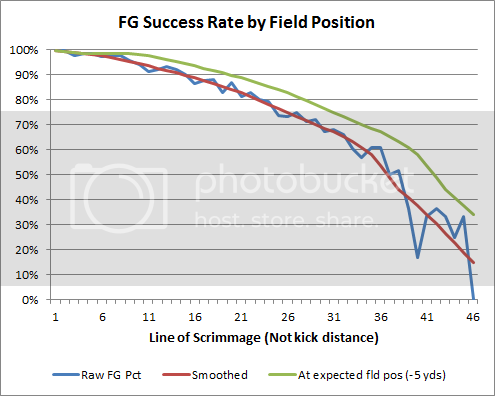 The force-FG option curves are so irregular because the time the defense would get the ball back is so irregular. The allow-TD curve is smooth because the time the defense would get the ball back is nearly immediate. The Giants had three first downs inside FG range. The first (1) was at 2:52 at the NE 34. The second (2) was at the NE 18 immediately following the two minute warning. The third (3) was at 1:09 at the NE 7. As the chart shows, 1st down #1 was well above the choke-hold zone. 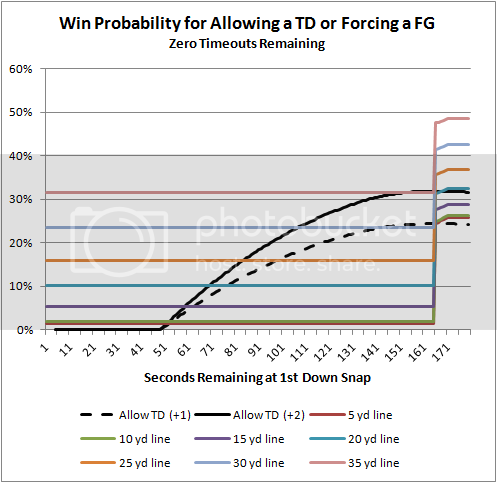 The probability of winning by forcing a stop and a FG attempt was greater than for trying to match an intentionally allowed TD in that situation. However, 1st down #2 was barely outside the choke-hold zone. 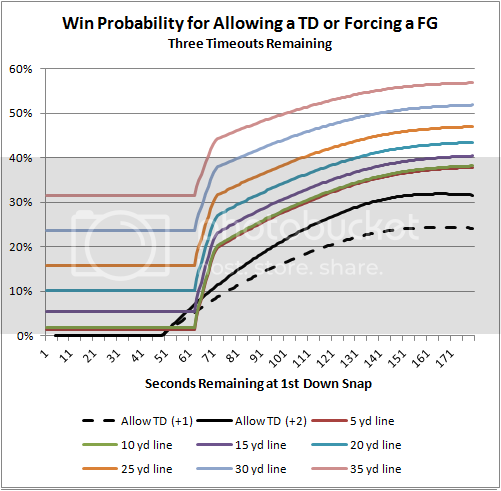 My original analysis had suggested the TD be allowed at this point, but that's partly because retaining two timeouts on defense in that situation is so uncommon that the general Win Probability model discounted it. If NE had only one timeout left, it would have been a no-brainer to allow the TD on 1st down #2 (see below). The other reason is that the Giants played unconventionally and with abandon, passing the ball aggressively even inside FG range. Curiously, Patriots coach Bill Belichick did not call a timeout between play #2 and play #3. Not until following a 1-yard gain on 1st and goal from the 7 did Belichick call his second timeout. 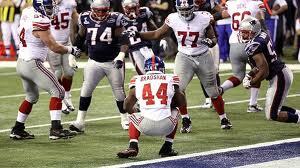 On the very next play, Ahmad Bradshaw was (by most accounts) allowed to score the TD. Ultimately, the Patriots got the ball with 57 sec to play and one timeout remaining. 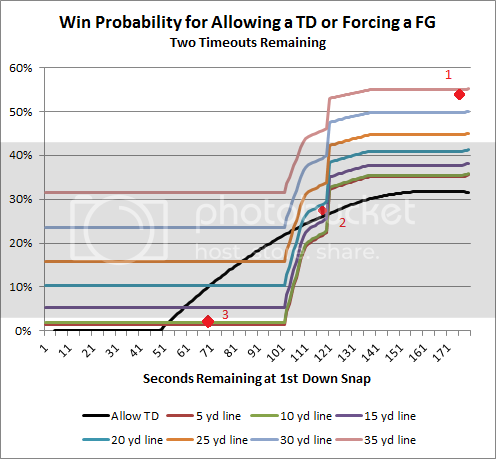 Had NE called a timeout prior to 1st down #3 and the identical events unfolded--NYG scoring a TD on their subsequent 2nd down--NE would have had an estimated 20% chance of winning instead of the 6% or so they had when they actually took possession. It's possible Belichick was hoping that somehow time would run out on the Giants. But it's more likely that, with two timeouts in his pocket, Belichick chose to wait to see how the first down play turned out before deciding to use them. If his defense held, he would use one, but if his defense allowed a conversion, he would wait to see how the subsequent first down play went. I think this was a mistake because at any time the very next play could be a touchdown, and he'd rather have the extra 39 seconds than an extra timeout on offense. Here are the resulting charts for when an immediate TD is preferable to forcing a FG. (Suitable for lamination, coaches!) With no timeouts remaining, the situation is very dire, and there is a relatively large window for preferring to allow a TD (or for taking a knee). The solid black line is the wp for when the team on defense leads by two points. The dashed black line is the wp for when the team on defense leads by one point. Note: I chose a value of 47% for the chance of the offense converting a two point conversion in the case of the 1-point lead for the defense. As a reminder, wherever the first down situation is above the appropriate black line, the preferred option is to force the stop and FG attempt. Wherever the situation is below the appropriate black line, the preferred option is to allow the TD. With a single timeout, the window gets smaller as the team on defense's ability to respond to a made FG comes into play. 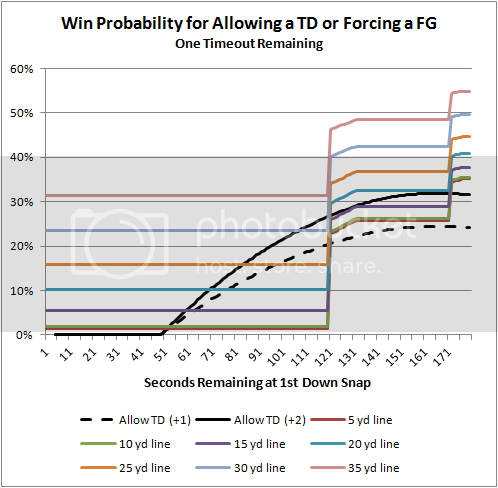 Here is the chart for two timeouts remaining, which we saw earlier in the example from Super Bowl 46. With all three timeouts available to the defense, the immediate TD is almost never preferable to forcing the FG. There's just a tiny window with about a minute left and the ball inside the 15. There's more work to be done. As pointed out by a commenter, if the offense misses its FG attempt but still has timeouts and time on the clock, the probability of winning by making a stop would be lower than I've estimated here. We also want to know the numbers for when the game is tied, or when the defense is up by three. This is why football is uniquely compelling. In what other sport would it be better to allow your opponent to achieve a major score? When would you prefer that your opponent score a goal in hockey or soccer or lacrosse? When would you want your opponent to ever hit a three-pointer? What about baseball or cricket? Sure, you'd prefer to walk in one run to save four runs, but that's instinctively intuitive, the same way a football defense would normally prefer to give up 3 points instead of 7. This may be the most complex, most challenging, and most counter-intuitive analysis I've done. There were some assumptions made in this analysis that could use some refinement, but I think we've got our arms around the problem, and we have a framework for further research. We also have a clear way of presenting the results in a way a coach can look up quickly in the heat of battle.